Some people think that because I worked for Microsoft for so many years that I’m an Apple hater. Well, that’s not actually true. Fact is, I’ve had a Macintosh on my desks, at work and home, pretty much constantly since their release in 1984, two of my family members have iPhones, and we have iPads, iPods, and Apple TVs scattered throughout the house. This is being written on a 27″ iMac, the one use for about 90% of my day. OK, part of that 90% is in Parallels running various versions of Windows and Windows Office. Unfortunately this post won’t help my argument that I’m an open supporter of both leading operating systems. Partially because these days I’m finding Apple so caught up in their image, their products exclusively, that they’re impressing me as a bunch of pompous jerks. Doesn’t make me automatically hate the products, but I’m no cool-aid drinking fanboy. Apple is doing plenty of crappy stuff to their customers, turning them more into consumers than unlocking their potential as creators is the big one. However, I’m getting off the point. Which is a case in point of how douchy and inept they can be. 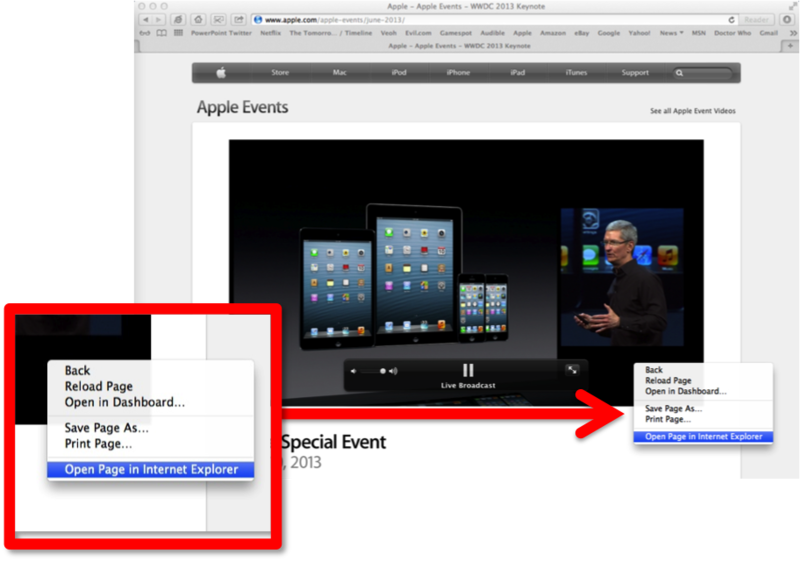 Earlier this month I wanted to watch the Apple WWDC Opening that was streaming from Apple.Com. However, if you weren’t using Safari as your browser, you were blocked. My default browser is Google Chrome. Yeah, if you weren’t going to wear their colors to the party, they shut you down at the door. OK, I don’t like Safari myself. Apple claims it’s the #1 installed mobile browser, but they don’t tell you that you aren’t allowed to remove it from their mobile devices, and you can’t set a different browser as preferred on their mobile devices. How’s that for anti-trust? (Remember the US Justice Department vs Microsoft for “bundling” Internet Explorer with Windows?) I think Safari is way behind Chrome in so many ways, and Chrome’s cross-platform support is superb. So I don’t use Safari. I keep it around when I have to access some non-standard Apple site, like the one in question. So I manually fired up Safari and started watching. I may find time soon to comment on how sad the state of design has gotten at Apple, this Ives guy really isn’t impressing me as anything more than someone trying to create a new fashion, not as a real product designer, but I’m getting off track again. This is what I saw when I right-clicked the Safari-embedded video. The disabled PowerPC version of Internet Explorer, that apparently still works it’s mojo. Yeah, it was like some amazing wormhole to an alternate reality had opened up on my screen. There was Safari suggesting that if I want to open this streaming QuickTime, I should use the Ten Year Old, PowerPC-only, Macintosh version of Internet Explorer. Granted, the old app is still on my machine. But even Finder recognizes it won’t run in the current OS. 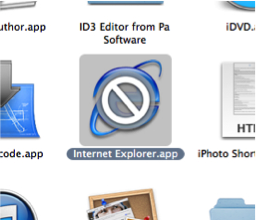 If you double-click it, you get the message “You can’t open the application “Internet Explorer.app” because PowerPC applications are no longer supported. I’ve kept the old app, and a couple of others, around because I’ve considered creating a virtual machine running the old PPC supporting OS X, just thinking I might write about some history there and it would be an easy way to pose the screen shots I’d need. But this was strange, and kind of pathetic Safari. I’d almost feel sorry for you. If you weren’t such a douche. This entry was posted in Business, Design, Geeking around, Media, Organizations, Software, Technology, Thoughts and tagged apple, Chrome, Internet Explorer, Microsoft, Safari, WWDC. Bookmark the permalink.